This month I have yet another great cookbook I would like to tell you about. 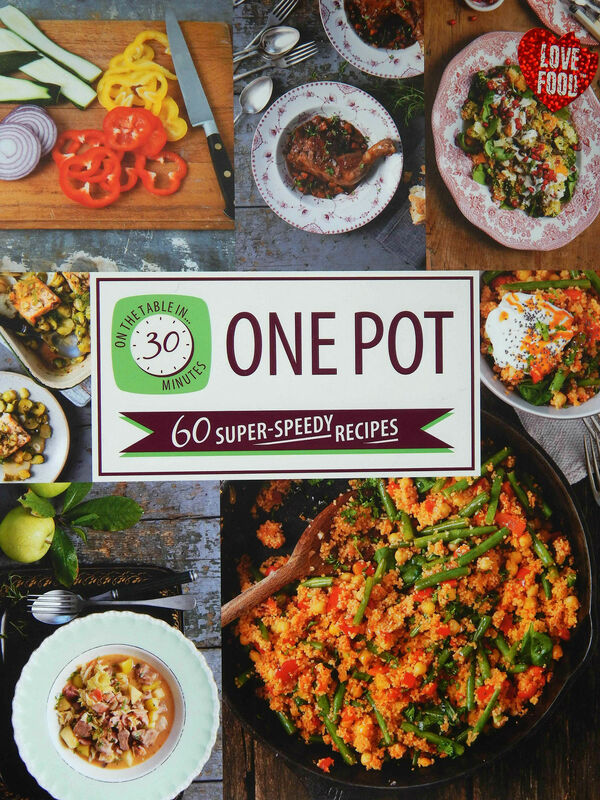 This time it is “On the table in 30: One Pot” 60 super speedy recipes. We all know that in this fast moving world time is of an essence and sometimes we really can’t spare half of the day for cooking a meal. I know someone who would really like that; stay in the kitchen all day and “play” with food creating some amazing dishes for others to enjoy, but the reality is cruel and there is no time for it. “On the table in 30: One Pot” is a perfect cookbook for anyone who wants to enjoy a nice healthy meal, which can be prepared fast and with use of only one cooking dish. Plus there is an introduction and a chapter on useful information. Every recipe includes a list of ingredients, picture of the dish and clear method on how to make it which is written giving you time indicators (30 minutes to go, 15 minutes to go, 5 minutes to go etc). This layout is actually very handy, as it gives you precise instruction and a countdown to when your meal will be on the table. I studied this book for a while searching for meals to cook, checking differences in methods and getting a general feel for it. There are a lot of lovely recipes in there. One of my favourite must be Spicy Bean Chilli. It is really easy and straightforward. It calls for a lot of store cupboards ingredients so it can be made without any special preparations and trips to the store. 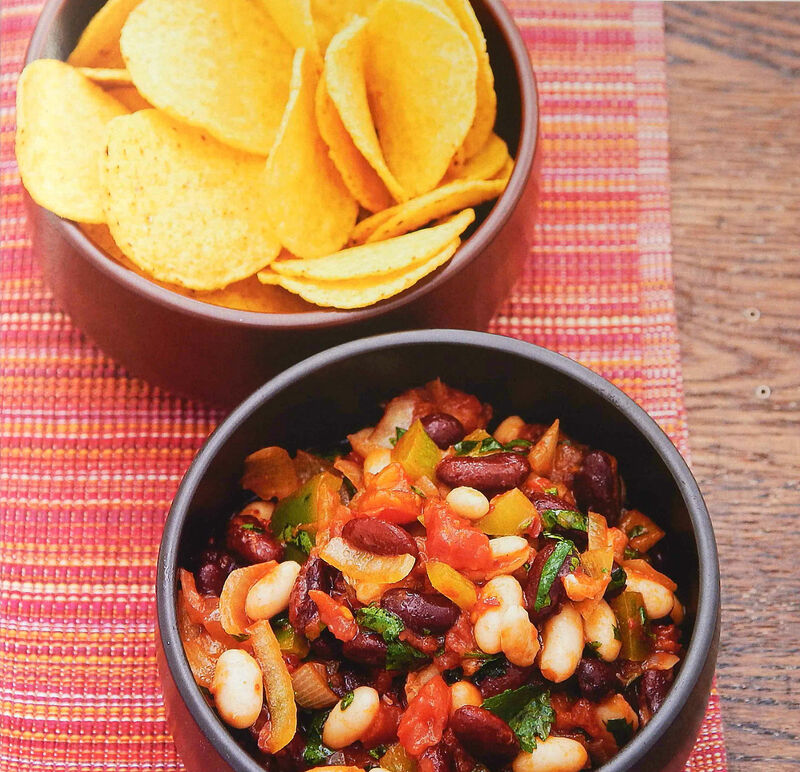 I didn’t try to make it as yet, but it is on top of my list and I will share with you once I make it… for now enjoy this Spicy Bean Chilli picture from the book. There are a lot of cookbooks on the market these days… some of them are better than others and some are just perfect. I would include “On the table in 30: One Pot” into the perfect cookbook category and let me tell you why… Mainly because it has a great selection of fast recipes, which can suit every household taste including any vegetarians at the table; but that’s not all… As I mentioned at the beginning “On the table in 30: One Pot” contains an introduction and a chapter on useful information. 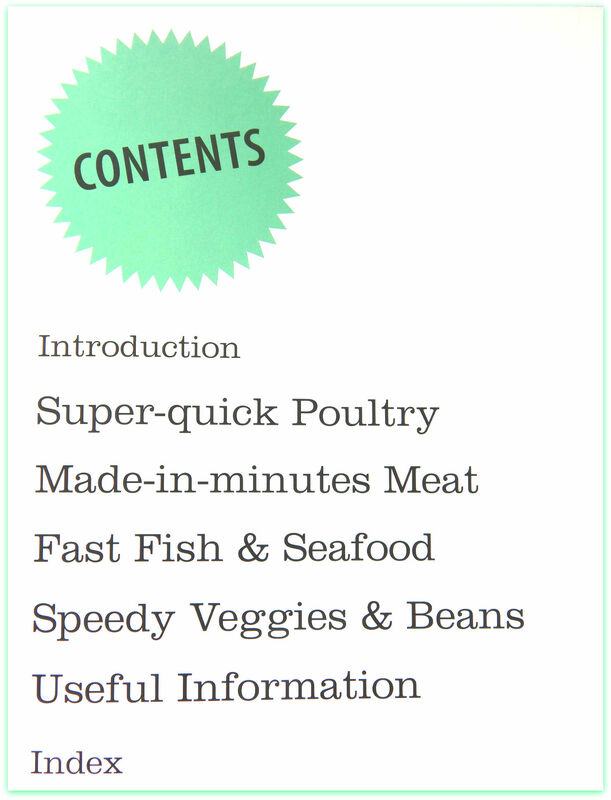 The introduction part gives you great hints and tips for quick preparation and cooking shortcuts. The useful information part has a lot of really useful information; strange I know! 😉 It talks about essential equipment, covers all preparation techniques and “supermarkets cheats” (you will have to get the book if you want to know what they are, my lips are sealed) and it has a clear temperature and measurement guide. I think this book will make a great addition to any cookbook collection but specifically I would recommend it to any new cooks, students and people always in a hurry, who are fed up of take away dishes and would love to eat a home cooked meal for a change. Do you have any tips on how to speed up the cooking process in general? Yummmy!!! That looks delicious! I love one pot recipes. Makes everything so much easier! seem like a great book…..i will look for this when i have my own hse.. The book cover almost made me drool because of all the food there. LOL I’m not really a good cook so this cook book will be very helpful for me! Thanks for sharing! 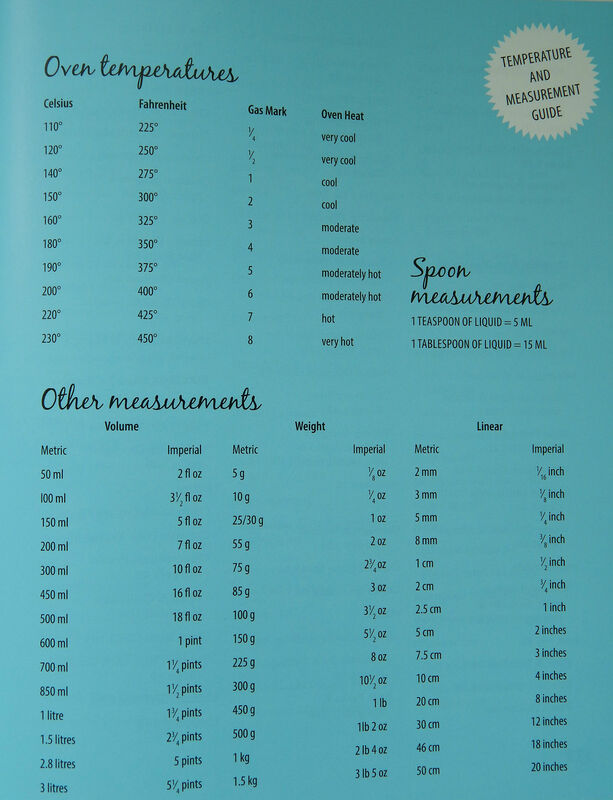 That looks like a great recipe book.. It’s good that they put the measurement there too.. This sounds like an awesome cookbook, but I guess it’s gonna be hard to find all the specific ingredients. Most of recipes in this book do not call for “weird” ingredients, they are really simple recipes and a lot of them use your “ordinary” every day products. what I don’t like about cookbooks is the difficulty in finding the ingredients. I hate how it’s so easy to find something yummy on a book, yet really hard to find the ingredients in it. I agree, sometimes finding an ingredient is a real challenge but this is a case mostly with foreign recipes. 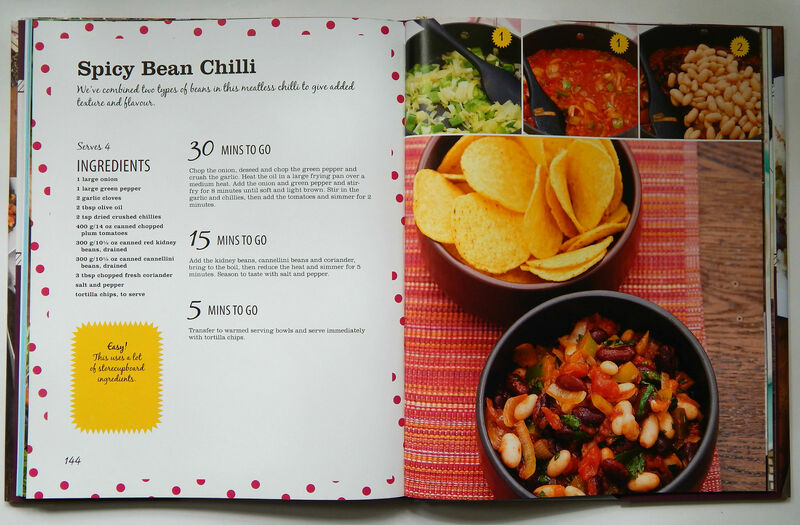 This cookbook is well suited for UK consumer. This looks delicious and so simple to do, I think I may very well try this. Great recipe! Awesome recipes. Something quick, easy and delicious is what everyone needs nowadays. I love the one pot meals. Especially when I can throw in the crock in the morning and it be done that evening. I like the sound of the Spicy Chili myself. I love 1 pot meals that are simple to make! This looks delicious! Love one pot meals – so much less washing up. This books sounds great. Thanks for sharing. Love 1 pot recipes! They are so much easier, love less washing up!